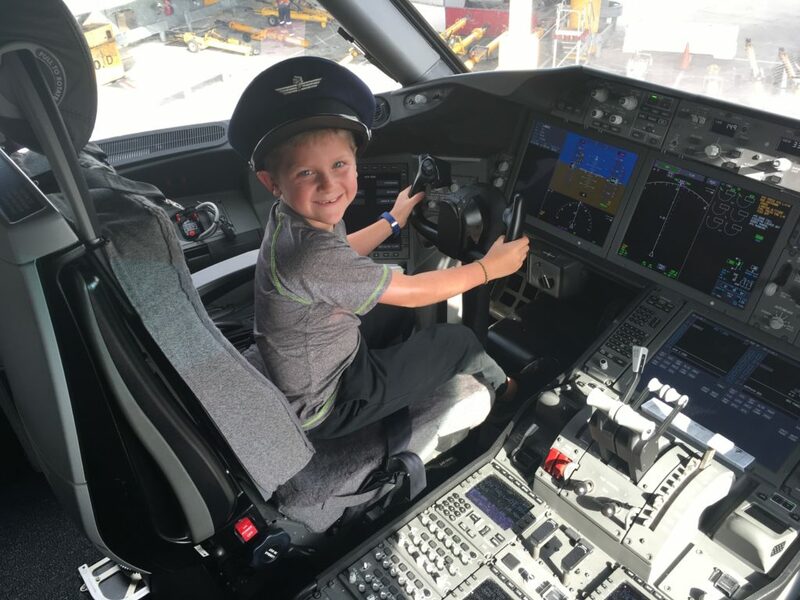 Family Frequent Flyer - How to travel the globe comfortably with a family of 5 on a budget.Family Frequent Flyer | How to travel the globe comfortably with a family of 5 on a budget. 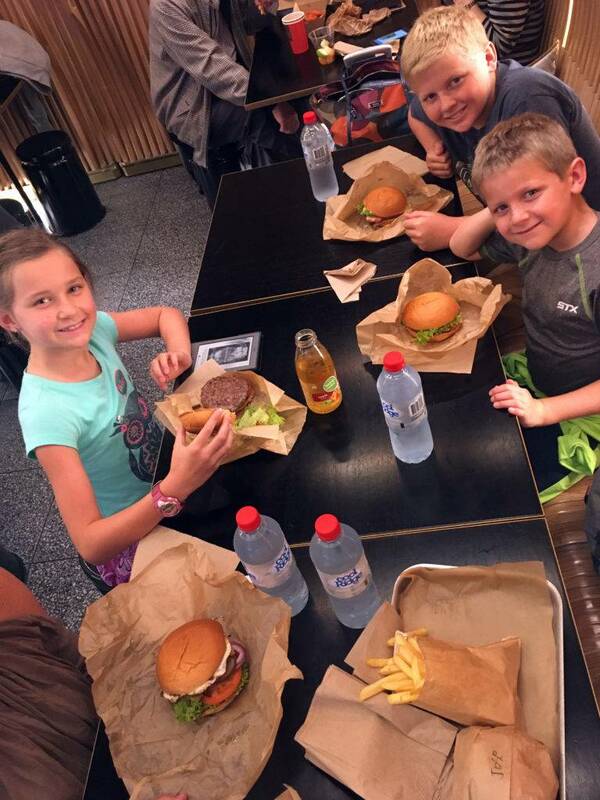 Australia is on the destination list for many families. The culture, the beaches, the wildlife, and the friendly people are a universal draw for families looking to travel. 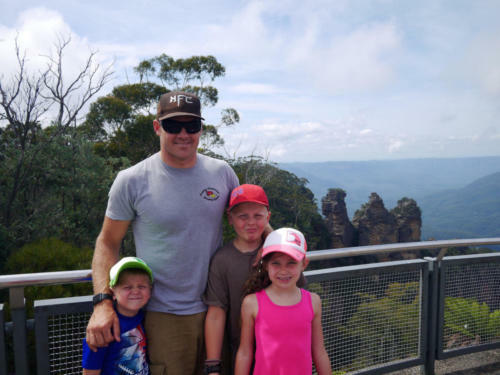 Our family is lucky enough to travel to Australia every year and enjoy this amazing country. 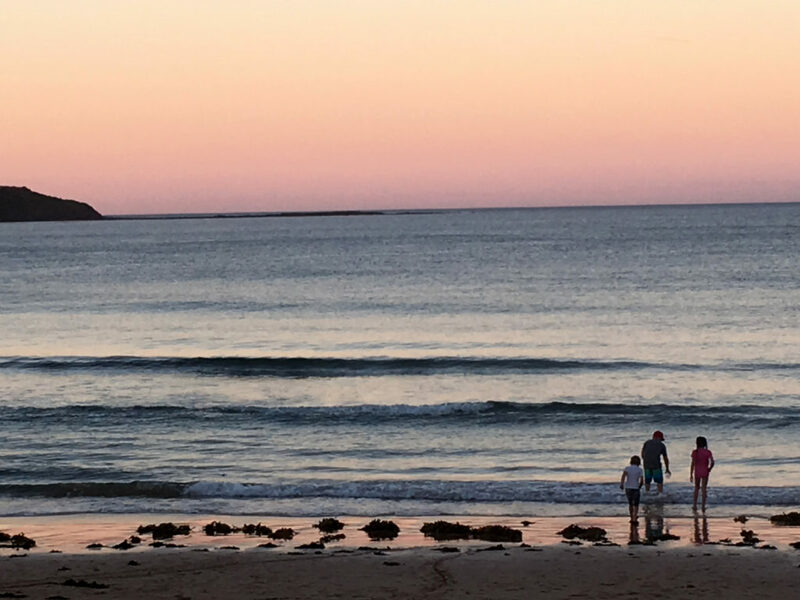 Family travel to Australia is rewarding with a huge array of possibilities. 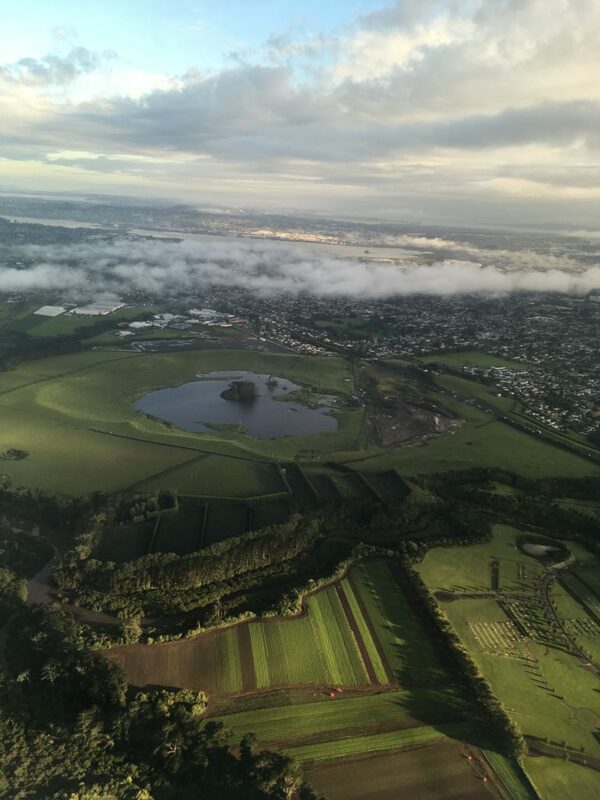 We fly into Sydney via Chile as we complete what we call the Triangle of Awesome. 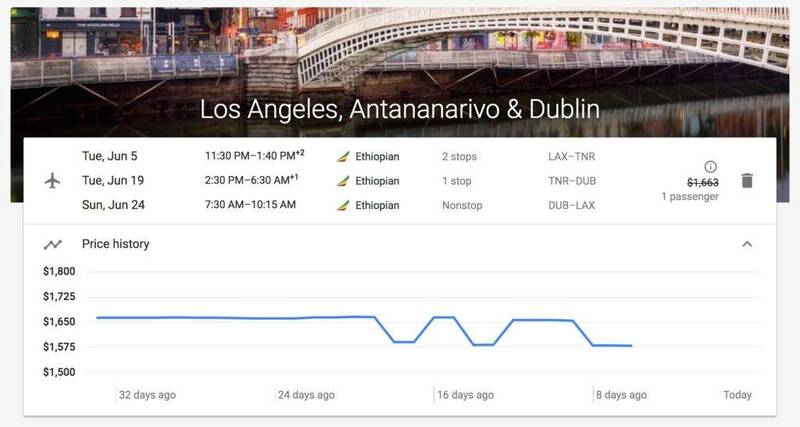 We travel to Chile for work so our travel plans are a bit unique. 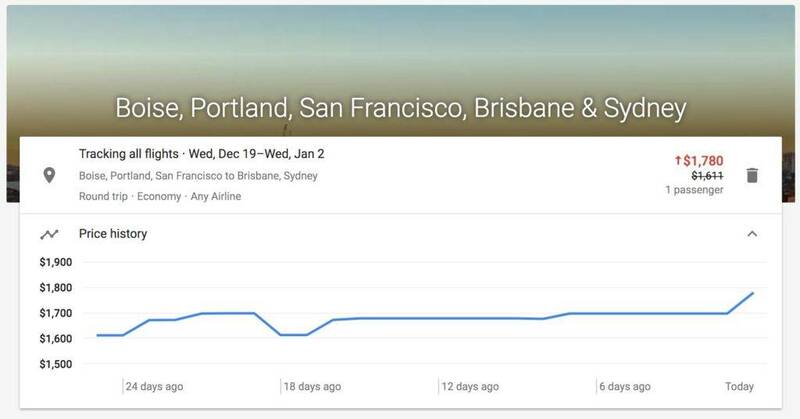 Flying into SYD is relatively straight forward although it can be expensive. 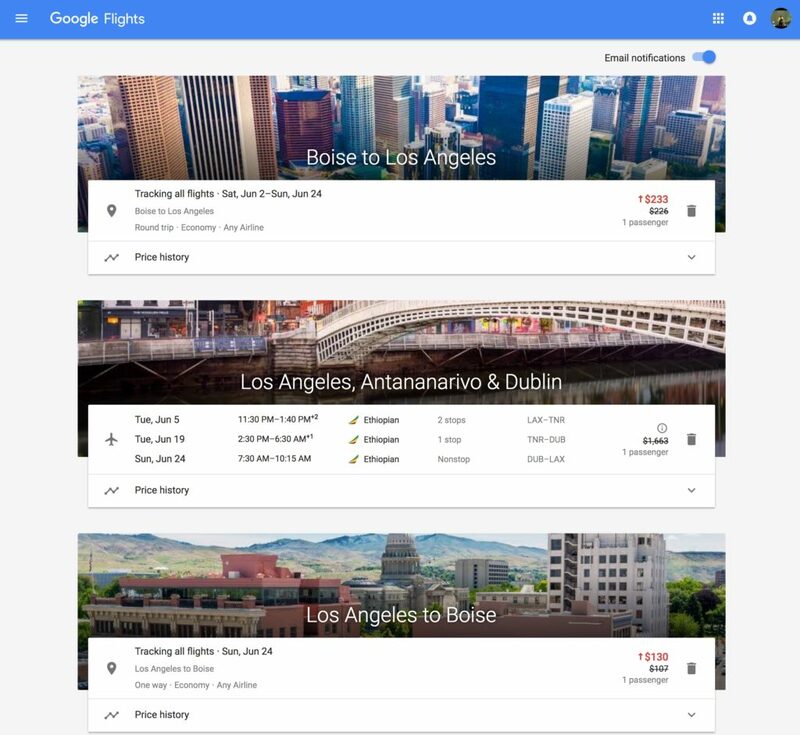 We use Google flight tracker to keep up on the cheapest fares. 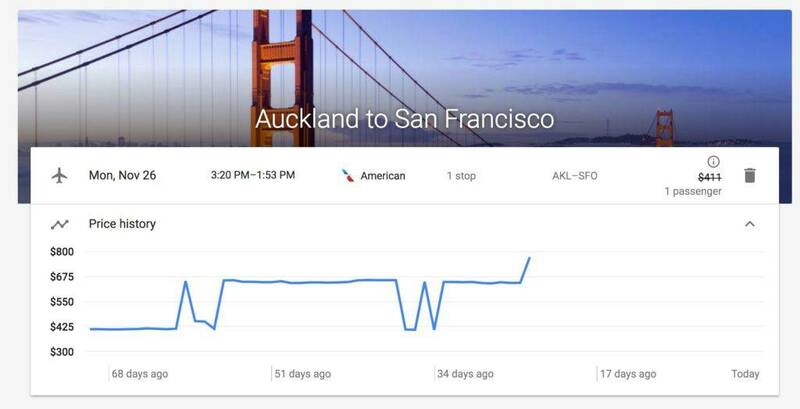 Find out how to use this great tool in our flight tracker post. Rental cars can be quite expensive and if you plan to stay longer than a week I would highly recommend a peer to peer car sharing program called Drive My Car. You can save a boatload of money over regular rental rates. 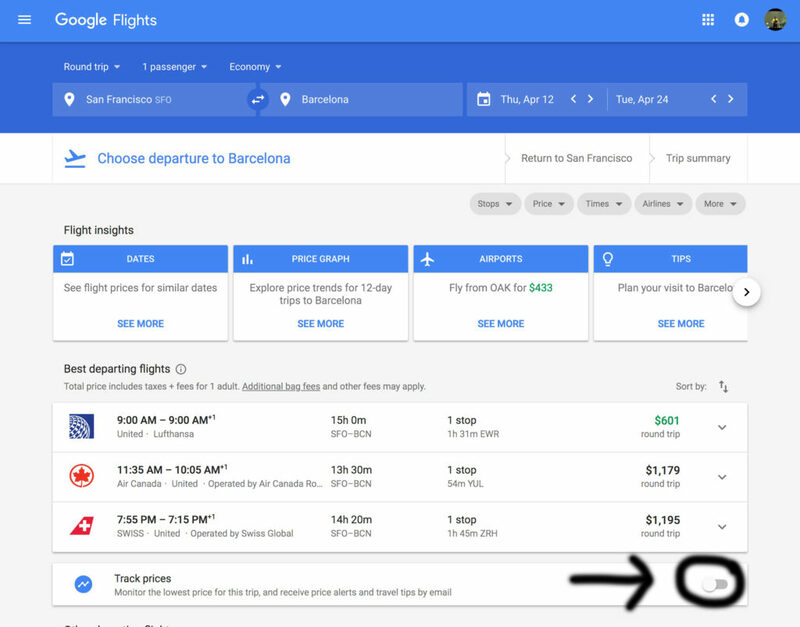 Depending on your goals and travel plans you have quite a few options for accommodations. 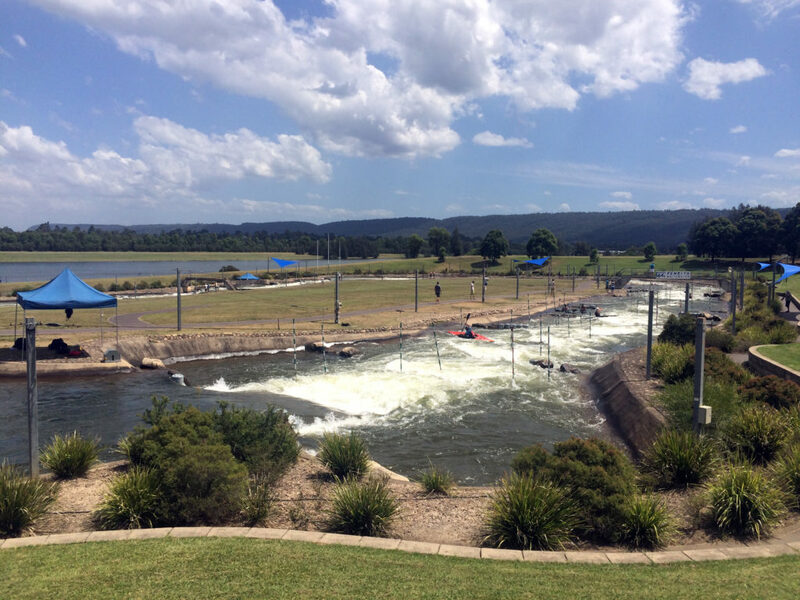 We have always spent our time in Penrith as it is near the Penrith Whitewater Center where I train. 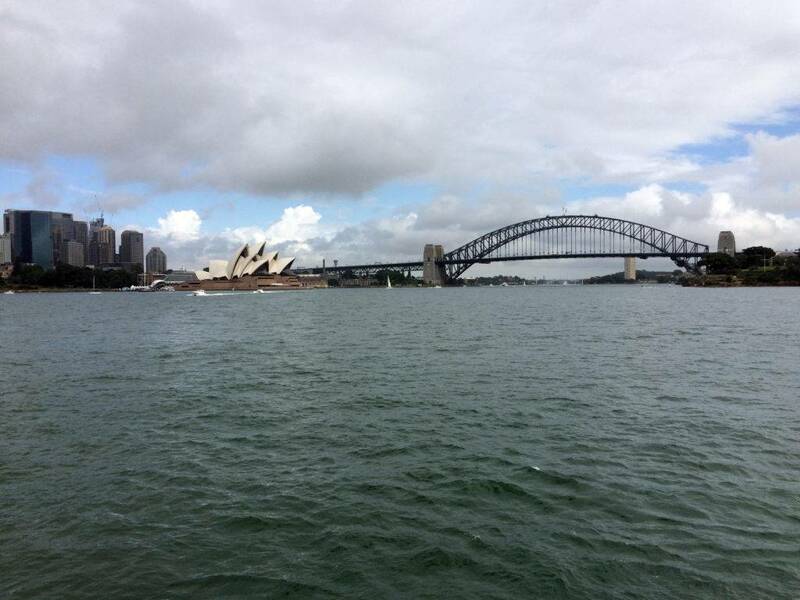 In Australia real estate is very expensive creating a vibrant rental market. You can rent a house or condo by the week in most suburbs from a leasing agency or use AirBnB to find your pad. We have used both and find its a bit cheaper to rent by the week from a leasing agency. 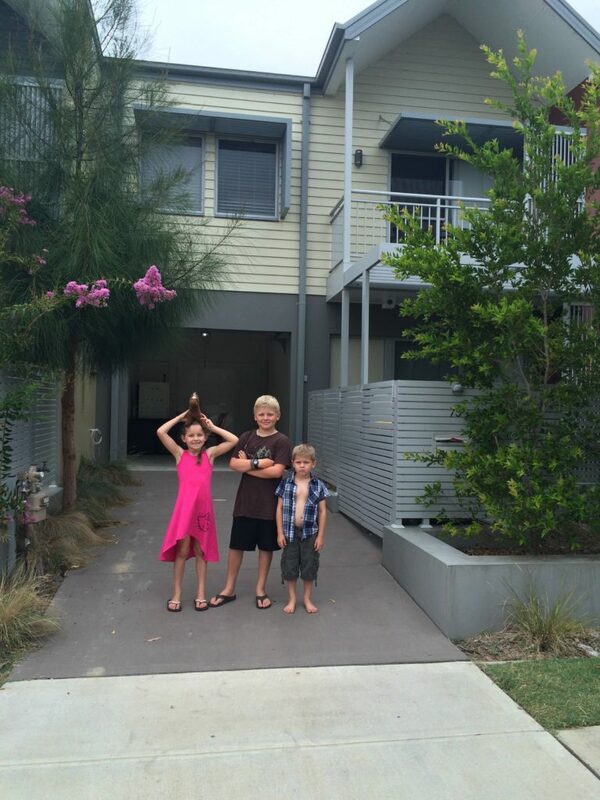 It can be expensive to find housing; for a 2 bedroom condo with a community pool and wifi we pay $1050AUD per week. 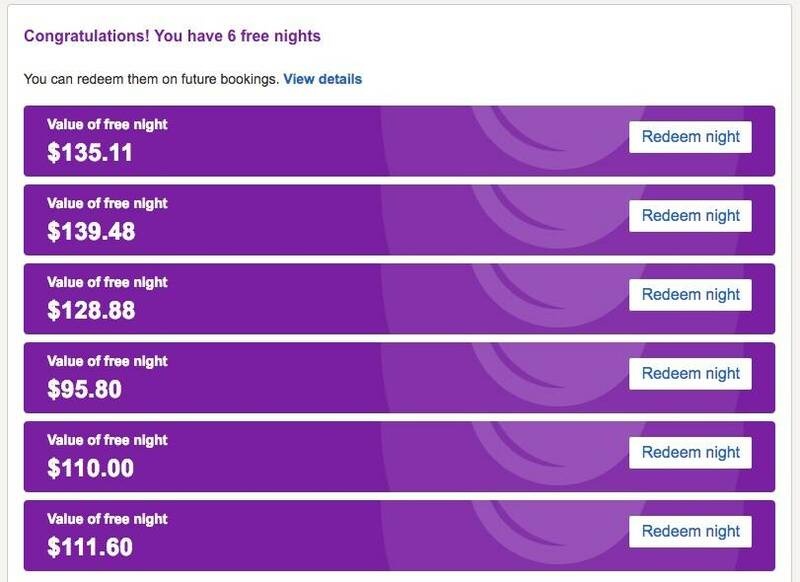 We use Western Sydney Accommodation for our go to as you pay less fees than with AirBnB. For us this is a no brainer as my kayaking career keeps me at the whitewater center daily. They offer exciting rafting and kayaking trips most days of the week over the summer. It was the site of the 2000 Olympic Games for canoe slalom and is free to visit and watch the rafters and kayakers navigate the artificial whitewater channel. If you find yourself in Australia during rugby season (March-September) then lookup to see if you can watch a rugby game live. They are super fun to watch and enjoy the spectators. The games we have seen have always been packed of people and very exciting. If you get general admission and want to actually get a seat show up a few hours early as it fills fast. You are quite close to the field which gives you all the more appreciation for the intensity of the game of rugby! Heading into the mountains from Penrith you quickly climb into the Blue Mountains. In this beautiful mountain range know for steep cliff, eucalyptus forests and waterfalls you can find vistas, hikes, and overlooks everywhere! 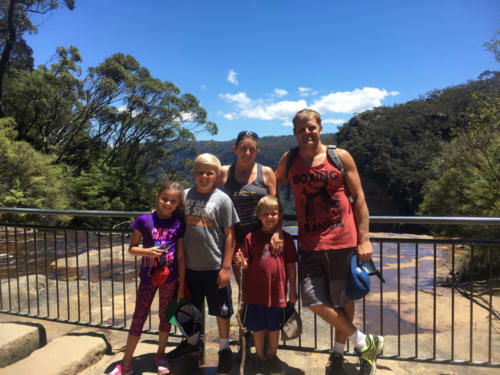 Specifically we enjoy visiting the 3 Sisters and Wentworth Falls. There are hikes of various difficulties that your family can enjoy and see the Australian outback. My daughters favorite place in all of Australia. Featherdale Wildlife Park is a koala bear conservatory that is a small wildlife park that has a free range policy with their kangaroos and wallabies. You can get up close and personal with them which all the kids really enjoy. You also can get close to koalas, they used to allow you to take a picture nearby to one, but since have changed their policy requiring a fee to take a picture with the koalas. Its a pretty small park, but has a cool variety of animals including Tasmanian devils, wombats, echidnas, dingos, and kangaroos everywhere plus a huge variety of birds. 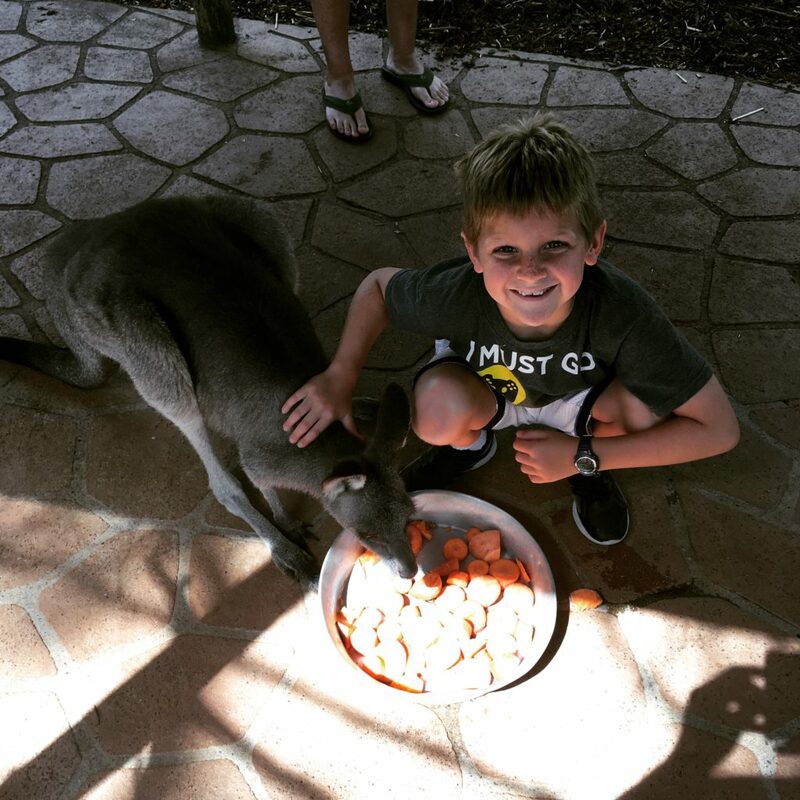 Its a bit expensive for the size but the interaction with the critters makes it worth it for us every time we go to Australia we go visit at least once. Beaches are EVERYWHERE and they are all incredible. You can find any number of them with variety. The beaches are sandy, clean, fun, and bountiful. They do a great job of having life guards and often will have a designated swimming zone that is watched by life guards that avoids dangerous rip tides. Depending on the season, wind, and tide there can be a lot of blue bottle jelly fish that wash up in the surf which can make swimming painful. When you arrive at the beach an easy way to tell if bluebottles are around is look for them on the beach washed up at the high water mark. If you see a ton of them swimming could be a bit more exciting as their sting is not dangerous but can be painful for the kids. 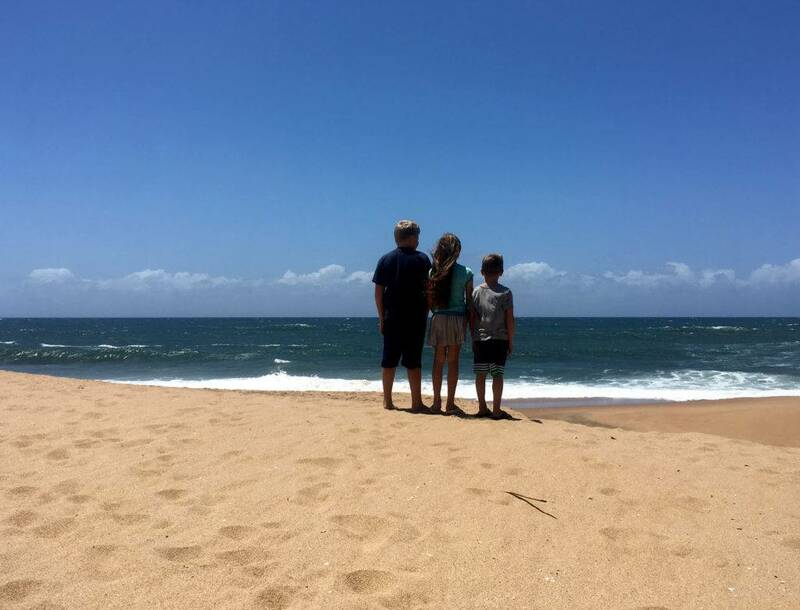 Our favorite beach is Dee Why as it has a great parking, beautiful water, good surf for the kids, is less crowded, and a great burrito place just up the street. Australia is a huge country/continent and there is MUCH more to do than listed above but if you are in or around the Sydney area this should give you an idea of where to start. 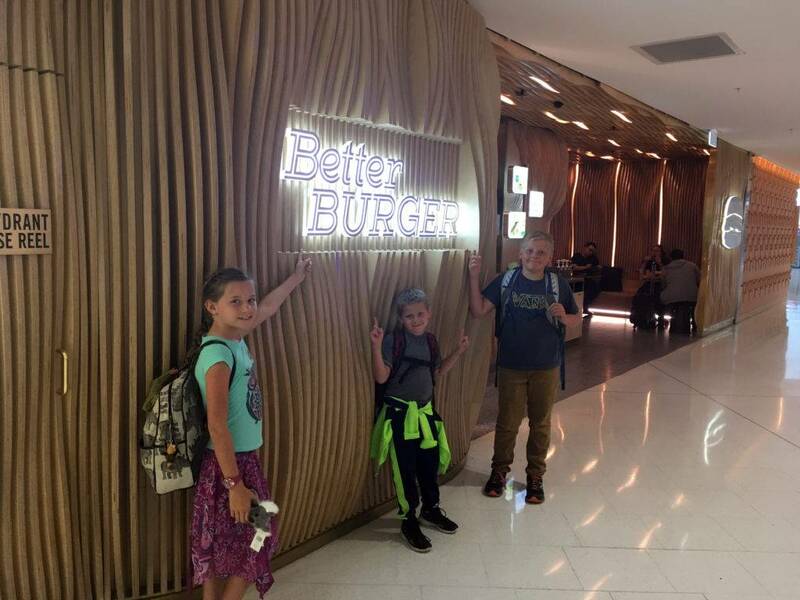 If you and your family travel to Australia during the summer, our families favorite TV show called My Kitchen Rules starts in early Feb and we absolutely love it; imagine a US show like Master Chef with Aussie, Frenchy, and Irish judges. 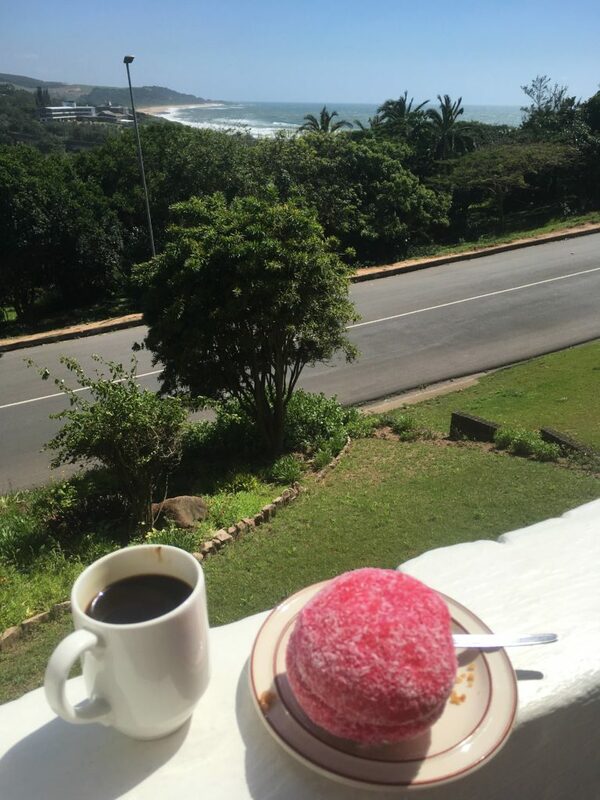 If you are looking for sun swept beaches that extend into the horizon South Africa has 1,600 miles of coast with both the Indian and Atlantic Oceans. We stayed on the coast for a week of fun and sun, it was incredible. Family travel to Africa can be a wonderful experience. We flew into South Africa via Johannesburg then took a flight from JNB to Durban. From Durban we rented a car and ended up in a small ocean front town an hour south called Scottsburgh. The roads were great, but make sure you have coins as there is a toll directly outside of the airport that accepts only coins. Luckily for us a motorist behind us helped out as we didn’t have any coins at all. Driving through Durban can have a lot of traffic so if possible plan accordingly to avoid it. Our goto site AirBnB got us a nice place called the Pearly Shells that had a kitchen with plenty of room for the family at an affordable rent. Although it was a bit dated, we enjoyed the stay and felt secure. It is recommended anywhere in South Africa to lock your valuables in the safe while gone and we always keep our passports on us when we go anywhere. The vista from our porch at the Pearly Shells Holiday Flats. If you like the ocean this is the place for you. There were MILES of untouched beach. It is recommended due to safety concerns not to spend time on desolate beaches so we tended to stay at the beach in town. Surfing, swimming, tide-pooling, and sunbathing became the afternoon tradition. My wife has what I consider a sick perversion to really want to swim with sharks. She did it once in Australia and we checked out Shark Cage Diving KZN to see if they had any opportunities. 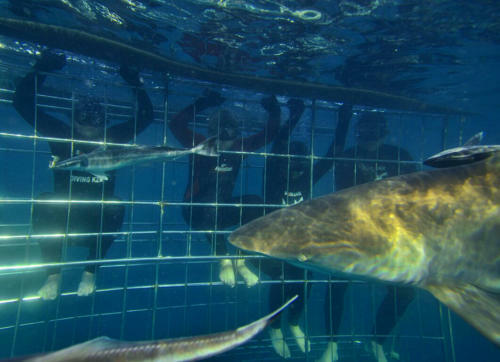 Sure enough they had a group that she, alongside my 11 year old son, could go do some cage diving. The beach head was a few miles south of town but the entire crew was EXTREMELY welcoming and friendly. After a safety brief, donning of wetsuits they were off in a boat while the other kids and I went tide-pooling. Their report was that it was fantastic. They saw a ton of sharks, got to spend a lot of time in the water and all the guides and staff were super helpful and accommodating. During a rainy day we headed back up to Durban to checkout the uShaka Aquarium World. Turns out its an aquarium and a waterpark which seems like an interesting combo. We opted for just the aquarium and started browsing. 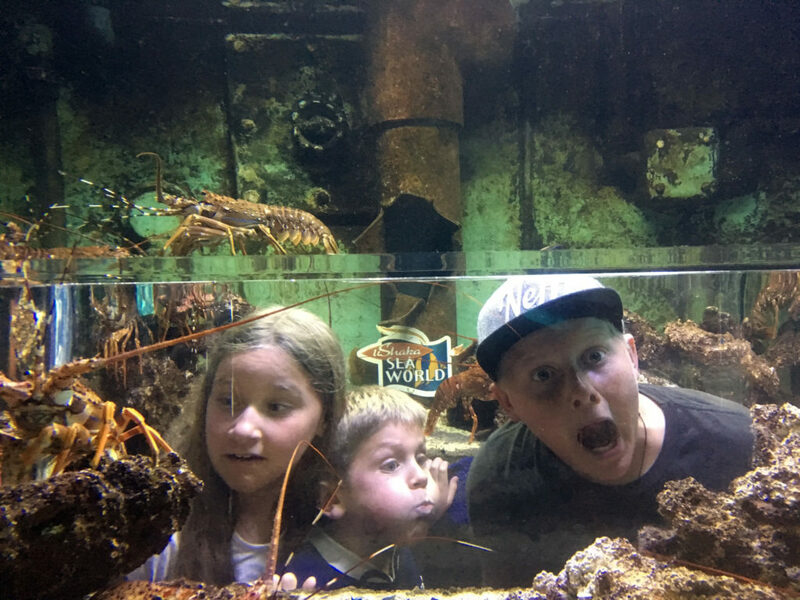 We were interested in this aquarium specifically as they are doing a lot of work to help the penguin population in South Africa rebound and continue. They had a great presentation with the penguins that the kids really liked. Other than that it was a bit of a let down, there was not a lot to see and the costs of entry seemed like a lot for what you actually got to see. We also had the singular experience of eating in the park. It was the first time that I have been unable to eat food that I ordered. We ordered a round of hamburgers from one of the restaurants and whatever the meat was, or what they put in it, made it inedible. 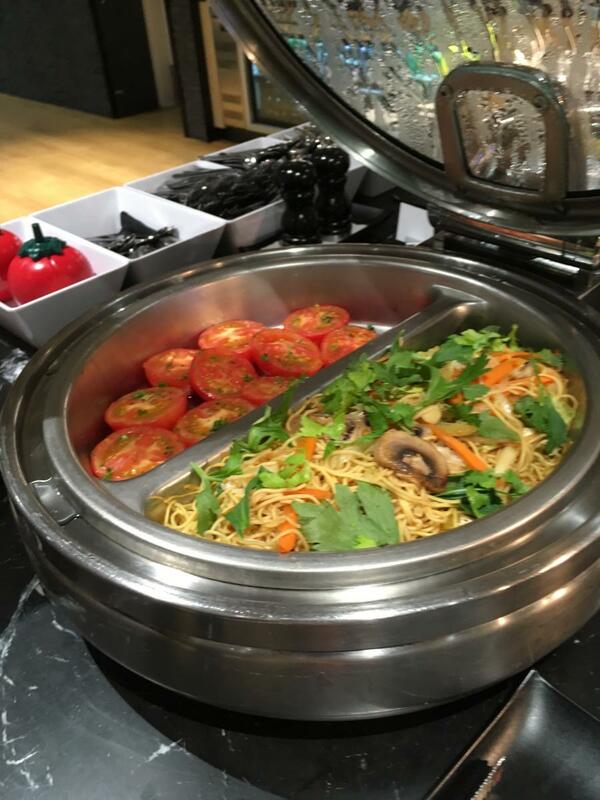 That was quite surprising to us because before then all the meat we had eaten in South Africa had been notably good! 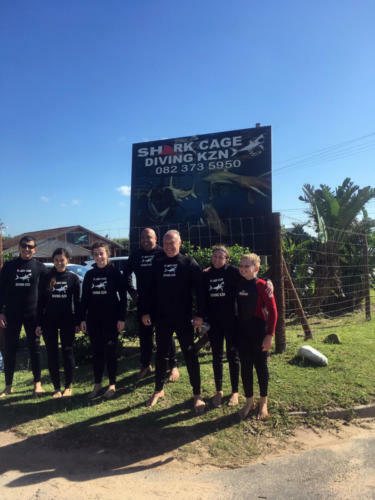 For us Shaka Aquarium would be a pass in the future or as a recommendations. Just 1km from our house was Croc World. After reading about it and seeing their conservation efforts we thought it would be fun to see. It did not disappoint! They have a TON of crocs just as the name implies. They have a bunch of presentations including dangerous snakes, croc feeding, baby croc handling, and snake safety. Each presentation was unique and engaging. Its a conservatory and we were happy to visit and would go back again! There is a great restaurant onsite which has an incredible view of the Indian Ocean. 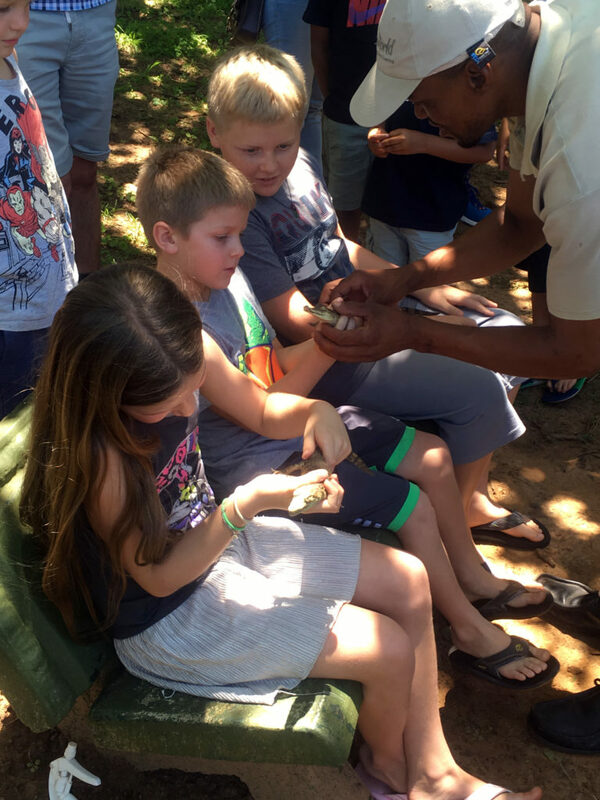 The kids really enjoyed getting to handle the baby croc and found the presentations engaging. If nothing else we learned which snakes to be sure to avoid in South Africa! They had a great snake exhibit and one of the largest crocs in captivity that had be relocated from a nearby village after attacking humans. 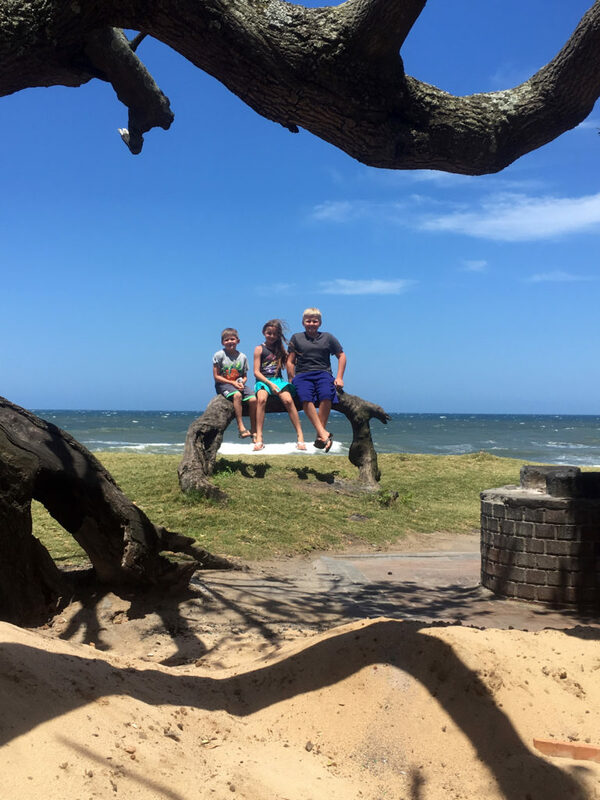 Family travel to Africa in Durban and the surrounding area have a ton of things to do, and amazing coastlines, and friendly people. Food and shops were accessible, activities were close, and the beach was amazing. A memorable week in South Africa. 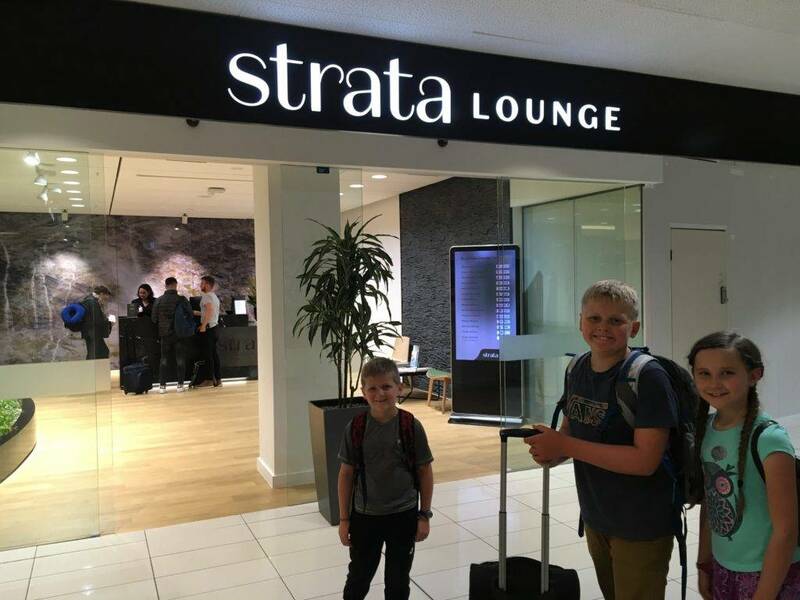 A few weeks ago we were able to pop into the Strata Lounge in Auckland, New Zealand during a trip from Santiago, Chile to Sydney, Australia. We had a quick 2 hour layover but the timing lined up perfectly for breakfast time and we were happy to tuck into a corner of the Strata Lounge for a quick visit. We were there pretty early in the morning and it was deserted! There were a handful of other people, but there were plenty of tables with chairs and couches for lounging. 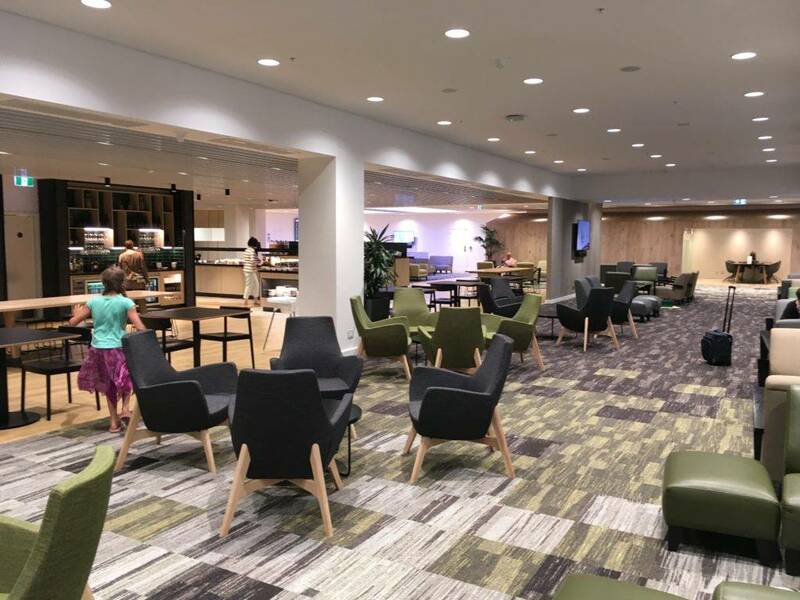 I am sure this club could handle a rather large crowd without feeling cramped as even the space between tables and couches felt particularly spacious which was a welcomed change after 12 hours of row 37 on LA801 (SCL-AKL). Everyone we interacted with were very friendly and the service was attentive. Excellent. 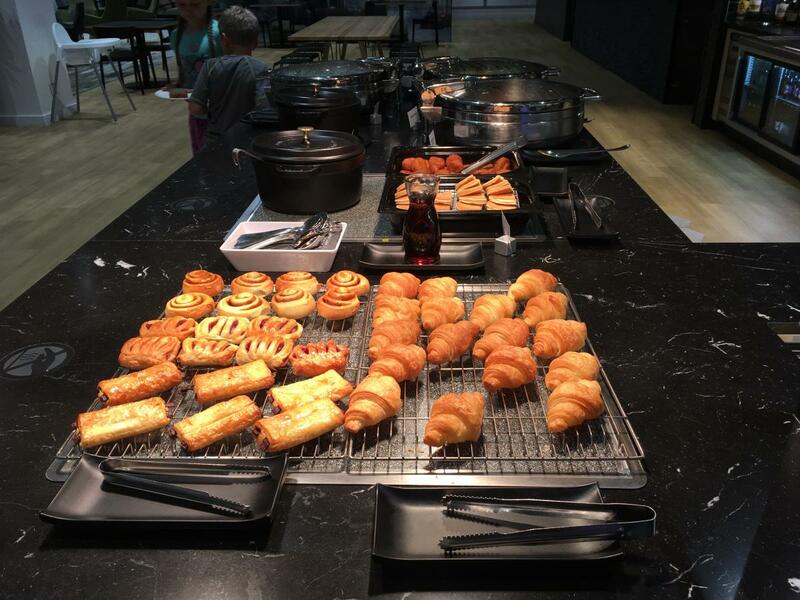 There was a marvelous selection of breakfast foods including sausage, pancakes, noodles, roasted tomatoes, hashbrowns, breakfast cereals, toast, smoothies, cheese and meat platters, and more. 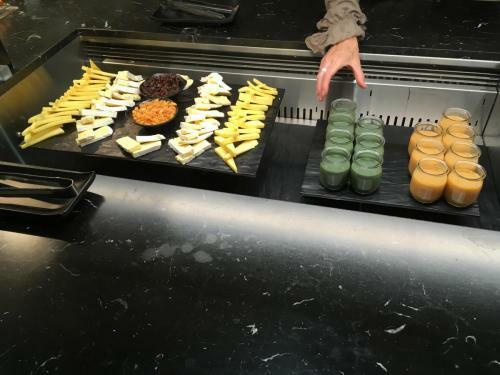 We didn’t sample the alcoholic beverages, but the coffee was fantastic, there was a great variety of juices for the kids. We felt it was in the top 5 of food selections we have ever found in a lounge. There were electrical outlets at each couch grouping which made a quick recharge quite convenient. They had an enclosed kids room with toddler toys, bean bag chairs, and a TV tuned into the cartoon station. 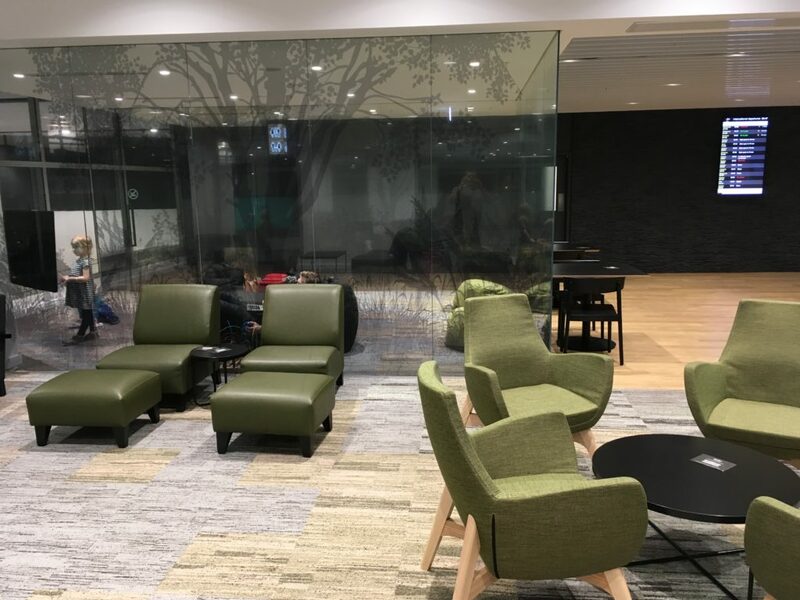 It was especially convenient as all the walls were glass so you could easily keep and eye on the kiddos while enjoying the comfort and quiet of a nearby couch or table. Its such a huge relief to have a place where the kids can stretch out a bit and move around with out worry about them breaking something. 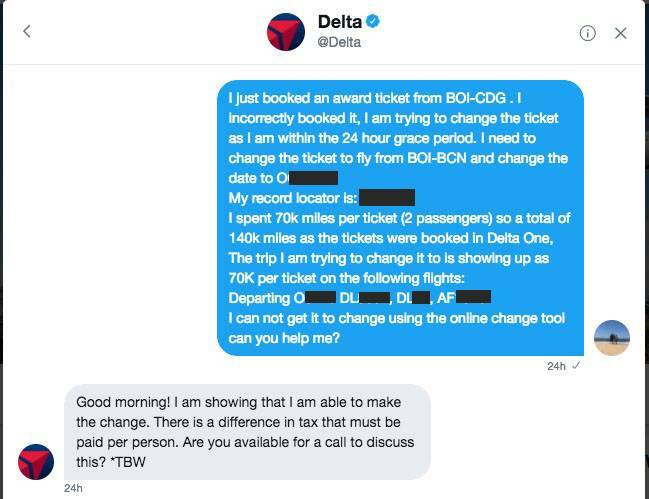 We gained access via our Priority Pass from our American Express Platinum card. Keep in mind that with the Priority Pass through Amex gets the primary cardholder plus 2 guests. 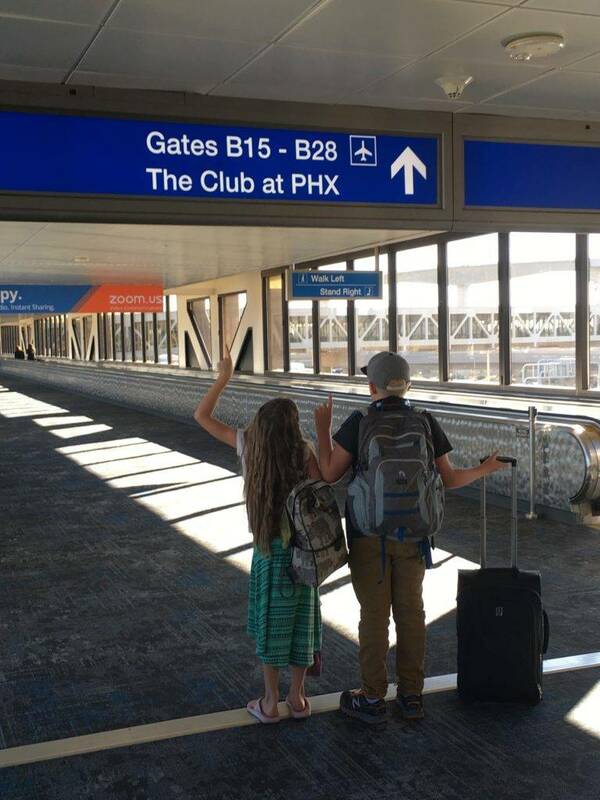 As we travel with a family of 5 we require 2 Priority Pass cards which we got by signing up my wife as an authorized user on my Platinum account. 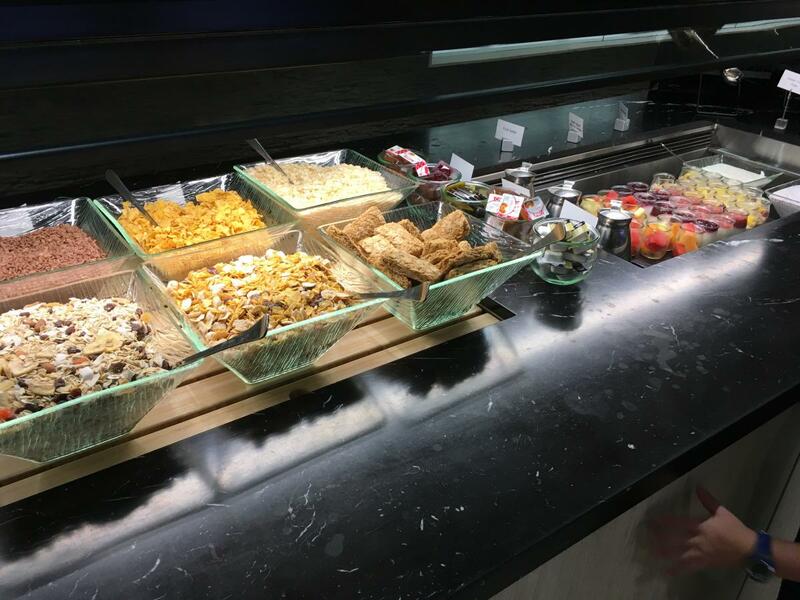 Awesome- they received the priority pass lounge of the year in 2017 and we could tell why. They had TV monitors displaying flight departures with average walk time to get there which is always welcomed in a new airport so you don’t leave too early or too late for boarding. The food was fantastic, it was super clean, people were friendly, and we enjoyed it!